About two decades ago, the only way for slot fans to engage in their favourite game with real money bets was to drive around and visit a brick-and-mortar gambling venue. Thanks to the rapid development of technologies, that is no longer the case. In the past fifteen years or so, an impressive number of legitimate online casinos have emerged, allowing slot fans to partake in their favourite game for real money from the very comfort of their homes. What is more, slot fans are provided with an extensive range of titles to choose from and there is something to suit all interests and preferences. Reputable gambling operators have partnered with some of the leading software developers, such as Playtech, NetEnt and Microgaming, so it is hardly surprising the slot games on offer stand out with vibrant graphics, fantastic animations and a plethora of lucrative features, including bonus games and spins, multipliers, scatter and wild symbols. Many of the most popular slot titles have been adapted for mobile play and run seamlessly on portable devices based on Windows, iOS and Android. Playing online slots for real money not only furthers one’s convenience, but also provides them with an opportunity to bag a hefty prize or even end their gaming session by winning a colossal progressive jackpot. If interested in playing the online slots for real money, we suggest you take a look at the following article to become better acquainted with the key aspects of playing real-money slots online. Slot fans, who lack experience in playing real-money slots online, are often concerned about the safety of their personal information and funds. However, such concerns are entirely groundless since all respected online casino operators are known to take good care of their players. A great stress is placed on security as all transactions to and from players’ casino accounts are heavily encoded with the latest SSL encryptions to prevent ill-intentioned persons from gaining access to personal information, bank account numbers and so on. More importantly, reputable online casino operators never share sensitive data with any third parties. Then again, there are players, who question the fairness of the online slots on offer. Again, there is absolutely no need to worry about that since the outcome of every single spin is determined by Random Number Generators to ensure all slot fans have equal chances of winning. The slots on offer are audited by accredited independent testing agencies, like eCOGRA, to ensure everything is fair and square. Additionally, the slots’ theoretical payout percentages are published on the casinos’ websites for everyone to see and often are updated on a monthly basis. Finally, we would like to say that established online casino operators are licensed and regulated by stringent and respected regulatory authorities, the likes of the UK and the Gibraltar Gambling Commissions, the Alderney Gambling Control Commission and the Malta Gaming Authority. These regulatory bodies work in the interest of players and strictly monitor the activity of their licensees in order to ensure a fair gaming environment is always at hand. It all starts with a simple registration process. Registering at a renowned online casino is free, convenient, and time-efficient. Once players provide their personal and banking details and complete the registration successfully, they need to fund their accounts in order to make real money bets. Please note that UK players are recommended to select the GBP currency when registering as this would spare them from incurring currency conversion fees. The good news is established online casinos accept an extensive range of reliable, convenient and easy-to-use methods of payment. These include debit/credit cards by Visa, Maestro and Mastercard, prepaid vouchers like those offered by PaySafeCard and popular e-wallets like Neteller, Skrill and PayPal. Deposits are typically processed in a matter of seconds and are free of charge so you can start playing your favourite slot right away. In some cases, withdrawals require several business days to complete. This delay can be explained with the verification process players are sometimes expected to go through. In some instances, registered members of the casinos are required to send scanned copies of their IDs, the front and the back of their credit/debit card as well as a copy of a recent utility bill to verify their address. This is to verify the customer’s identity and prevent fraudulent activities like money laundering, for example. More often than not, the winnings are paid back via the same banking method the player had used to fund their casino account. One of the biggest advantages of playing online slots for real money is that slot fans get to claim various lucrative bonuses and participate in different promotional incentives. 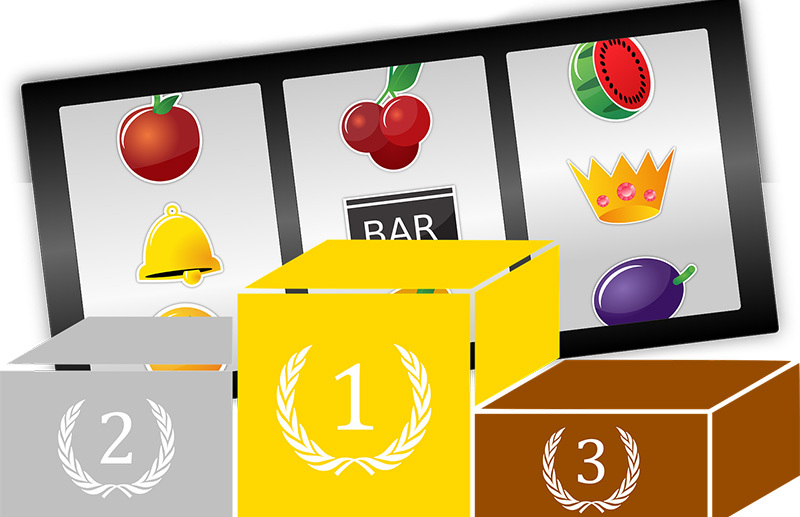 Established online casinos reward both new and existing players with numerous bonuses. You will find more detailed information on these below. Make sure you read your preferred casino’s Terms and Conditions page carefully because there are wagering requirements, which are to be met before you attempt to cash out the winnings you have accrued with the bonus credits. Newly-registered members of online casinos are usually awarded a sign-up bonus as a means of welcoming them into the community. Please note that you are expected to opt in for the bonus during or after registration, depending on the casino. Sometimes you need to enter a specific bonus code. The Welcome bonuses typically require a deposit to be made. This deposit is later matched with a specific sum. For instance, if you claim a 100% Deposit bonus and fund your account with £50, you will receive the additional sum of £50 in bonus credits to play with. Often, players are awarded bonuses upon their second, third and even fourth deposits. However, to qualify, players will have to deposit the minimum sum allowed by the casino, which often is £10. However, many online casinos reward players with No Deposit bonuses simply for signing up with a real-money account. As a general rule, No Deposit bonuses are smaller – for example, BetWay, Hippodrome and 32Red all offer £10 No Deposit bonuses for new players. While the sum is indeed humble, No Deposit bonuses pose as a nice way to test the slots on offer without risking your own funds. Free Spins bonuses are a favourite of slot fans. Some online casinos reward new players with a specific number of free spins on selected slots from their portfolios. Often the free spins are part of the Welcome bonus package and require a deposit to be made. However, at some web-based casinos, it is also possible to claim a No Deposit Free Spins bonus. An example would be BGO Casino where slot fans are awarded 20 free spins simply for signing up. Offering Reload Deposit bonuses is a widespread practice among established online casino operators that value their player-base. Claiming a monthly bonus is also an option, but such promotions are usually offered via email. The size of the monthly bonus sometimes is determined by how often you play. Some casinos reward their most loyal players with bonuses every week. Reload Deposit bonuses are granted when players deposit via a specific payment method. More often than not, the size of the bonus varies between 5% and 15% of the deposited sum. So if you have deposited £100 via your Visa or Mastercard and the reload bonus for this method is 15%, you will get the additional sum of £15 to play with free of charge. Loyal players are highly valued by renowned online casino operators which is why they grant Refer-a-Friend bonuses to all customers, who bring new players to the casino. For example, if you have a friend interested in playing the slots online, you can refer them to your casino of choice. Once your friend has completed their registration and has made their first deposit, you get to claim your bonus credits. Naturally, the friend should provide your casino account’s username so that the casino knows who referred them. On some occasions, the friend is also expected to wager a specific percentage of their first deposit in order for you to obtain your referral bonus. It all depends on which casino you two have registered at. Collecting Comp Points is yet another way for existing players to boost their online casino balance. Players are eligible to collect these points from the very moment they sign up and make their first real money wager. Each bet you place will earn you a specific number of points. Once you have collected a given number of points, you can exchange them for real money or more bonus credits to play with. However, the exchange rates differ from one online casino to another. Avid slot fans often opt for participating in slot tournaments on selected slot games at online casinos, because such competitions offer a great value for their money, not to mention the playing experience is much more exciting. In many cases, slot fans are required to pay an entry fee in order to participate. The fee contributes to the prize pool that will be divided between the winners at the end of the tournament. From this, it follows that the greater the number of participants, the bigger the prize pool will be. We can distinguish between several types of online slot tournaments, which offer a completely different experience. Some slot tournaments are scheduled and have starting and ending times. These are typically advertised at the casino’s website in advance so players can react in due time and join in. Similarly to online poker players, slot fans can join a Sit and Go slot tournament. The length of such tournaments is determined beforehand, but the difference is the number of participants is also set in advance. Once the maximum number of entries has been reached, the Sit and Go tournament can commence. More often than not, players are again expected to contribute to the prize pool by paying an entry fee. Typically, Sit and Go tournaments rarely last more than an hour or two. Then again, it is possible to partake in Freeroll tournaments. As the name itself indicates, players are not required to pay a buy-in fee in order to take part in one such tournament, which typically lasts for about an hour. The aim is to accrue as many credits as possible as the greater the winnings you generate during the freeroll, the higher you climb up the winners chart. Once the freeroll finishes, the top finalists are awarded their cash prizes. There is also the option to partake in a Survivors slot tournament. These are actually elimination competitions that often comprise of three rounds that usually last about five minutes each. About half of the participants get eliminated in the second round on the basis of the number of credits they have won in round one. About 10% of the players make it to the third round and typically, only the top ten survivors receive cash prizes. In most cases, the intervals between the different rounds last roughly ten seconds which certainly contributes to the overall excitement. What is so great about registering at an online casino is the fact that it will enable you to play your favourite slots for real money on the go, from all locations and at all times. All established online casino operators offer websites that are fully mobile responsive, not to mention software developers have adapted some of their most popular slots for mobile play. While the mobile catalogues are not as extensive, slot fans are still provided with an impressive number of quality titles to choose from. Many of the most well-known online casino brands in the industry offer dedicated Android and iOS apps for a free download. Nevertheless, if you do not wish to download and install one such app on your portable device, you will still be able to play the slots on the go as the casino’s websites are mobile-compatible and many have already adopted the universal HTML5 language. Once you load the casino’s website in your phone’s browser, you will be automatically redirected to its mobile version. Managing your account, processing deposits and withdrawals, and claiming bonuses via your portable device are exceptionally simple and convenient processes. In addition, you will surely find mobile play offers even more vibrant graphics and clearer animations due to the higher-resolution screens. Not to mention, you still have the opportunity to bag a hefty prize while on the move.